BRAND NEW Rocktron X-Tune Chromatic Tuner Xtune Guitar Bass Effect Pedal !! 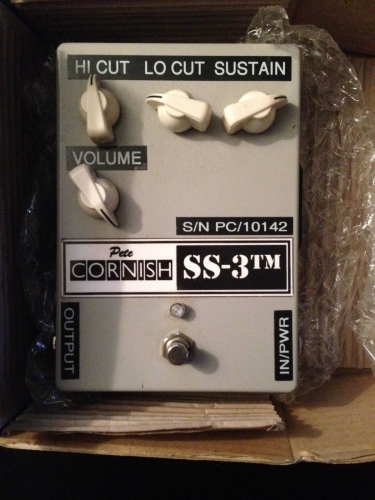 Pedal Auction Description: Velcro backed Pete Cornish SS-1 pedal. Great shape. 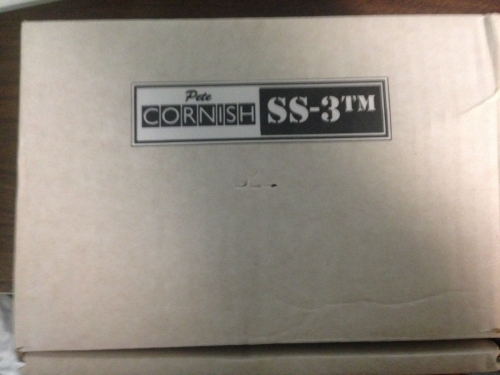 Moved to a Helix, so no longer needed.Free UPS shipping to Continental USA.On Jun-11-17 at 12:13:07 PDT, seller added the following information:Item for sale is the SS-3 pictured. I made a mistake on my initial posting and couldn't change it. 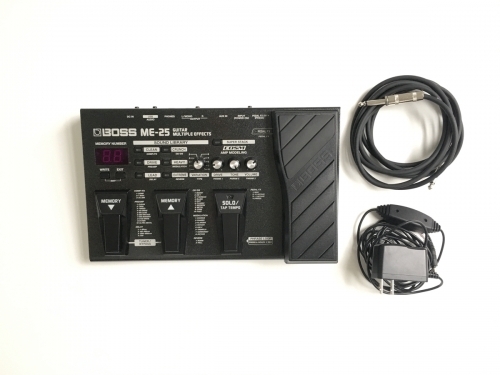 Pedal Auction Description: Sound pedal in excellent condition, perfect for any electric instrument including guitar, bass or violinThree pedals plus EXP pedal: Memory Up, Down, SoloThree knobs for real time control and editing. "Sound Library" organized by type: Clean, Crunch, Rhythm, etc. Ten variations within each typeSeven effects groups: Comp/FX, OD/DS, Preamp, Modulation, Delay, Reverb, Pedal FXPowerful COSM amp models and effects onboard, from classic to contemporarySuper simple user-friendly interfaceSound Library provides extensive collection of ready-to-use tones; simply choose a category and select a variationSounds can be instantly edited with the Drive, Tone, Level knobs and Expression pedalSuper Stack adds immensely heavy low end and punchPhrase Loop function with 38 seconds of recording timeFunctions as a USB audio interfaceBuilt-in AUX input for jamming along with external music devices (MP3/CD players, etc. 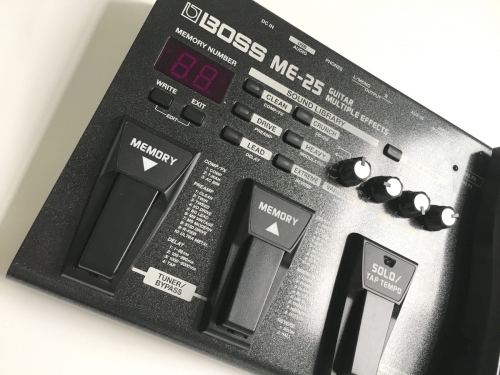 )Runs on six AA batteries or AC adaptorIncludes Cakewalk SONAR 8.5 LE software and dozens of audio loops, rhythms and songs for jamming or practiceAD Conversion 24-bit + AF method*1 DA Conversion 24-bit Sampling Frequency 44.1 kHz Memory 60 Sound Library 60 Sound Library Category clean, crunch, drive, heavy, lead, extreme Effect Type comp/FX (Compressor/Effect): comp, T.wah, AC sim, OD/DS (Overdrive/Distortion): boost, OD-1, t-scream, blues, dist, classic, modern, metal, core, fuzz, preamp: clean, twin, tweed, VO drive, BG lead, MS vintage, MS modern, 5150 drive, r-fier, ultra metal, modulation: chorus, phaser, flanger, rotary, uni-v, tremolo, harmonist, octave, delay: 1-99ms, 100-990ms, 1000-6000ms, tap, REVERB: room, hall, pedal FX (Pedal Effect): wah, +1 octave, -1 octave, freeze, NS (Noise Suppressor) Nominal Input Level input: -10 dBu, AUX IN: -18 dBu Input Impedance INPUT: 1M, AUX IN: 22k Nominal Output Level -10 dBu Output Impedance 2k Display 7 segments, 2 digits LED Power Supply DC 9 V Dry Batteries (R6/LR6 (AA) type) x 6, AC Adapter (BOSS PSA-Series: sold separately) Draw 150 mA Expected battery life under continuous use Alkaline: 9 hours, Carbon: 3 hours (These figures will vary depending on the actual conditions of use.) Dimensions: 11-13/16"W x 7-9/16"D x 2-7/8"H Maximum: 11-13/16"W x 7-9/16"D x 3-11/16"H Weight: 4 lb. 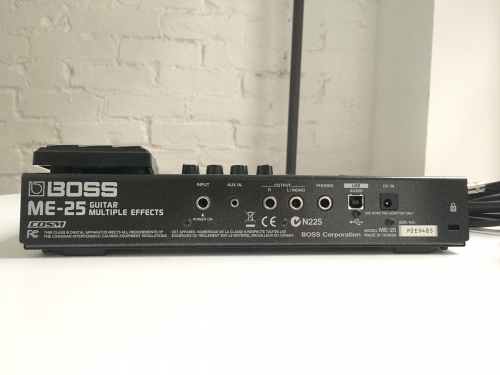 4 oz (including batteries) Accessories: Owner's Manual, ME-25 DVD-ROM, Sound Library/Memory List (Leaflet), Sound Library Sticker, Dry Batteries (Alkaline: LR6 (AA) type) x 6, Roland Service (Information Sheet) Options AC Adapter Boss PSA-SeriesWidth300 mm11-13/16 inchesDepth191 mm7-9/16 inchesHeight72 mm2-7/8 inchesWeight1.9 kg4 lbs. 4 oz.